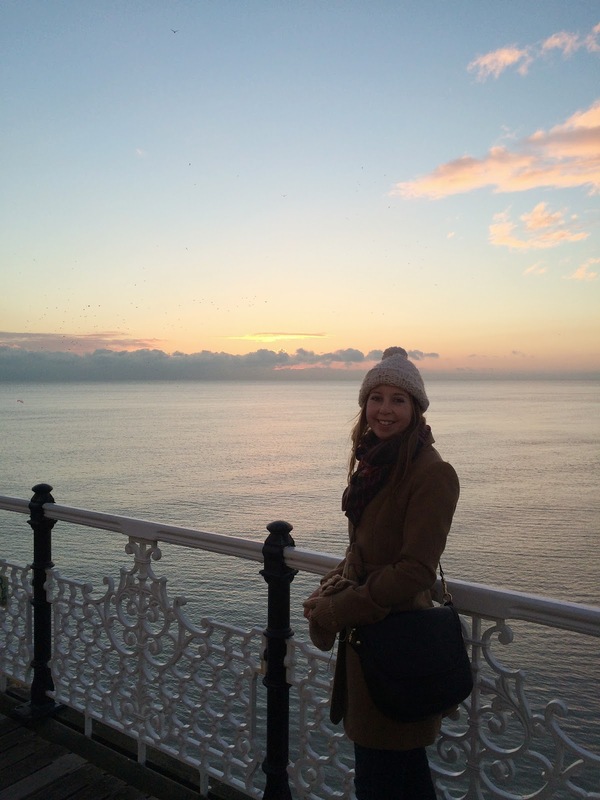 A Day Out in Brighton. 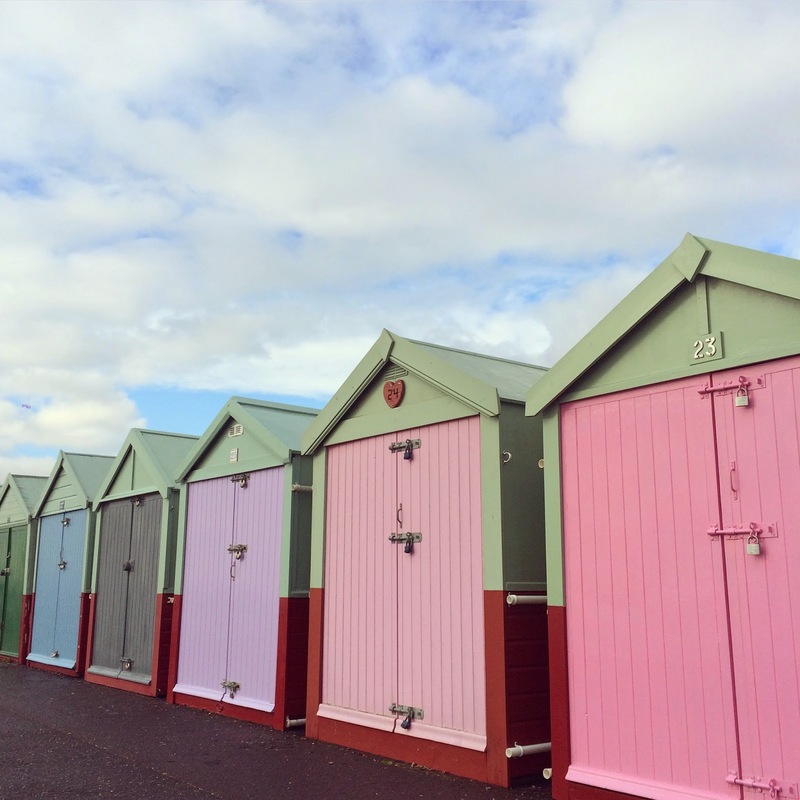 Pink Beach Huts, Skies and an Amazing Roast. 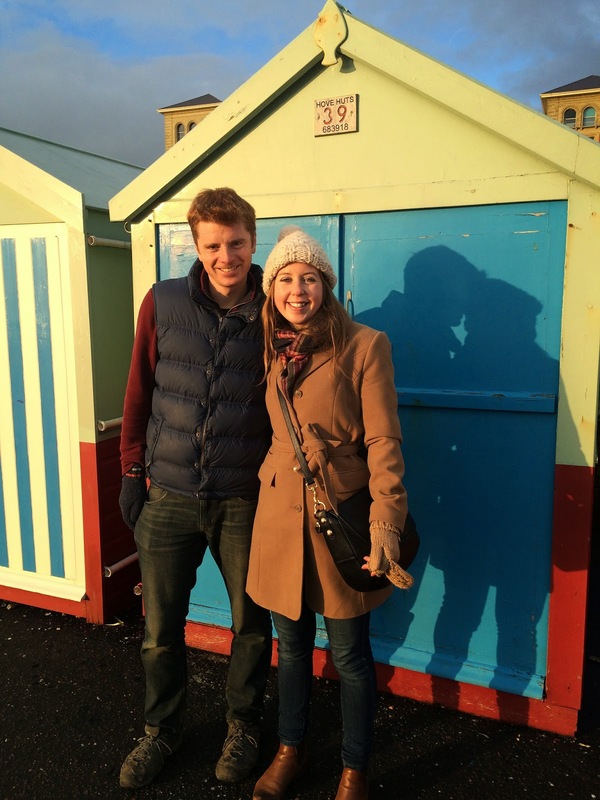 On Sunday, Ben and I decided to go to Brighton for the day to visit my brother. He's at uni there and loves it. We've been a few times before for day trips with friends on the train or just driven down by ourselves, it's only about an hour and a half from where we live and from London. But this was a particularly lovely day there. Such a great place to visit, even in January! And I've just realised that this is the third beachy post of the week, can you tell I like the seaside? 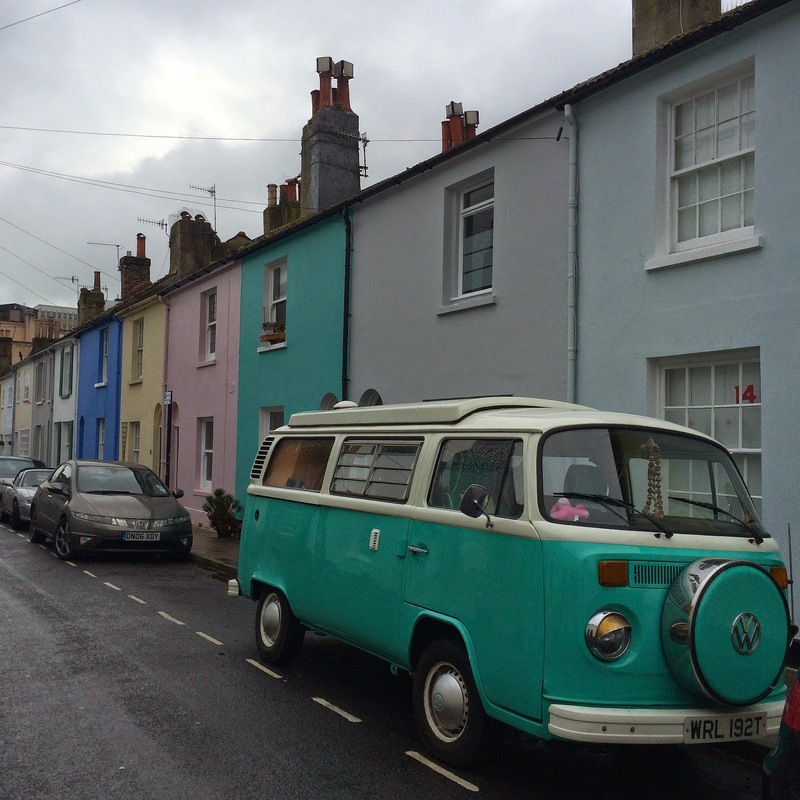 I love Brighton's quirky streets, the whole town is a bit alternative whilst still being super cosmopolitan and described by some as 'London on Sea'. There's so much to see, we started in the North Laines, an area with lots of bohemian independent shops and trendy coffee shops and cafes, think industrial bulbs and the like. 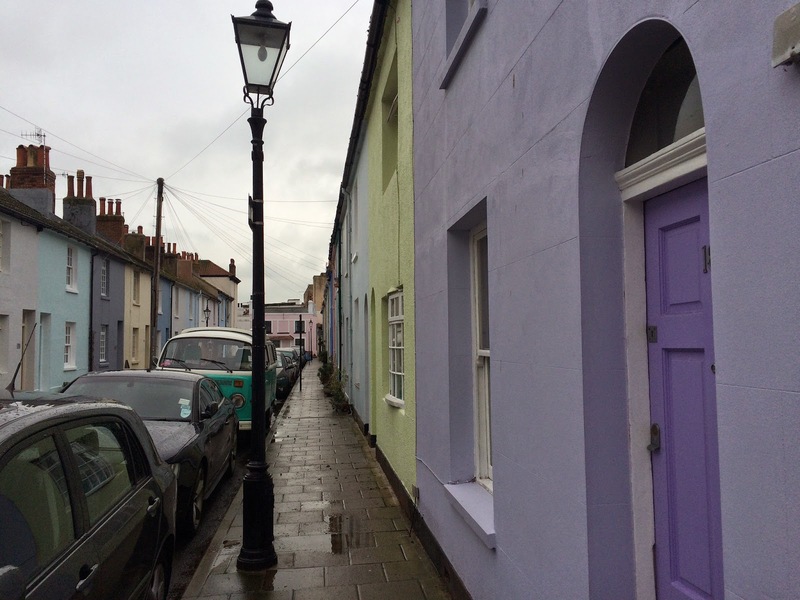 I love these coloured houses on one of the surrounding streets. You can browse the shops, mini flea markets and antique emporiums for ages. 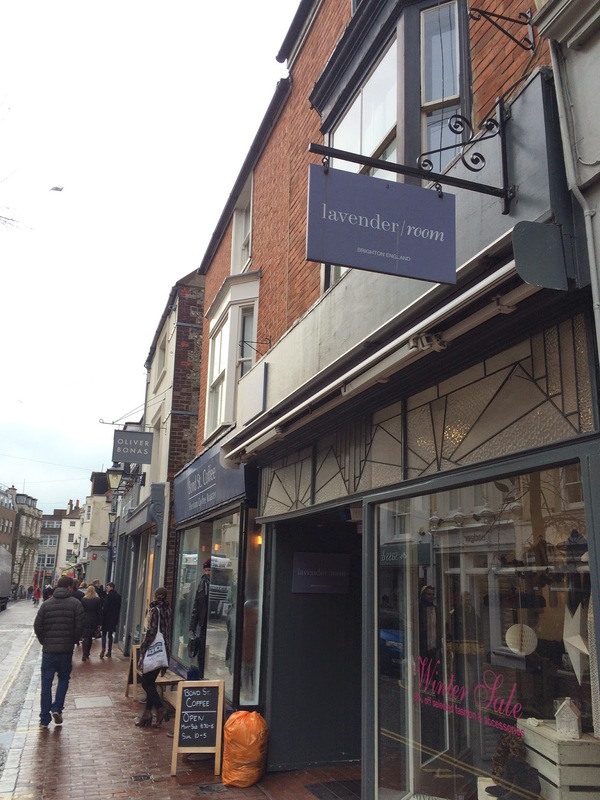 Snoopers Paradise is good for a wander, my favourite shop is the Lavender Room stocked with lots of pretty home accessories and clothes, just next door is Oliver Bonas another favourite. 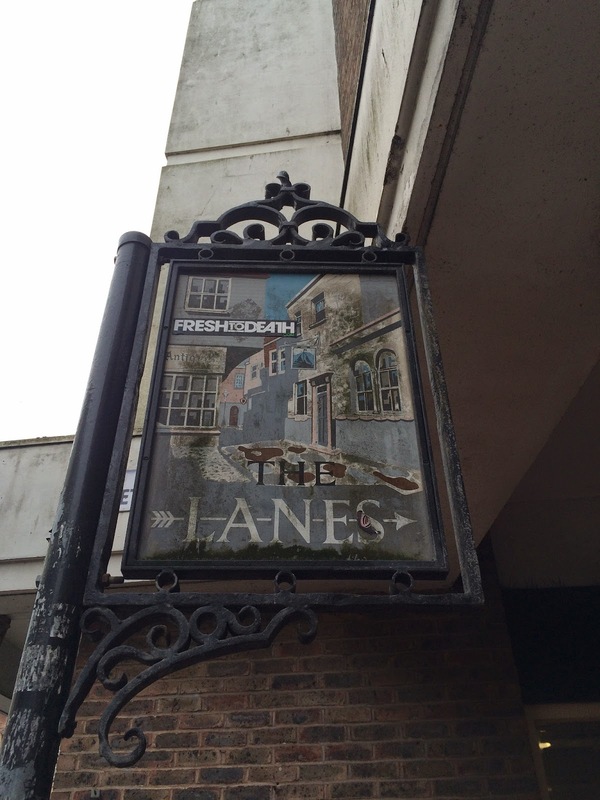 From the North Laines, we made our way down to the main high street in Brighton, crossing over to The Lanes. 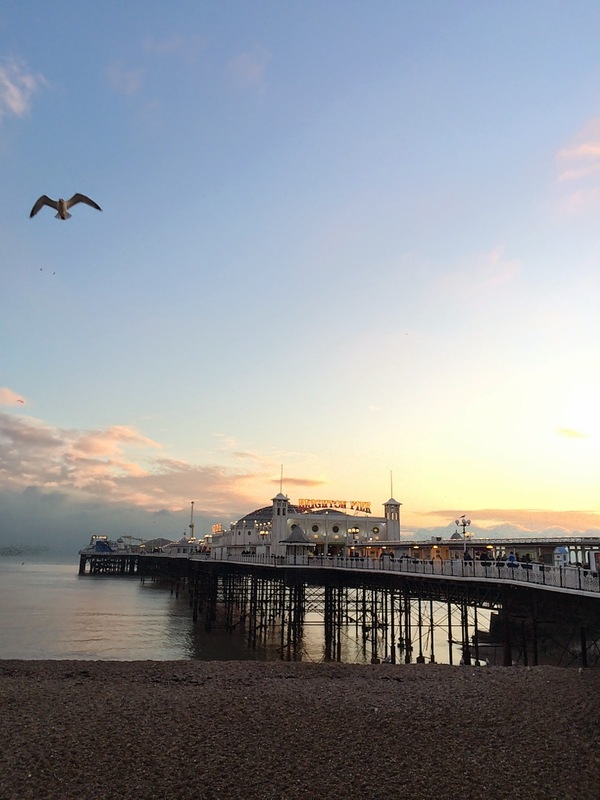 It's Brighton's historic quarter with a warren of narrow lanes with cute shops and amazing jewellers. 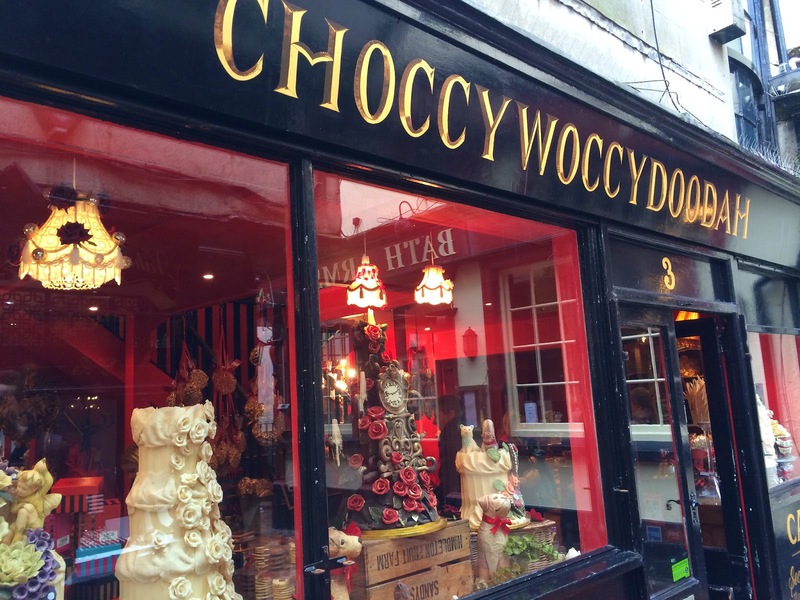 There's lots of fudge shops, interiors, bars, restaurants and amazing cake shops like this famous Choccywoccydoodah, with everything made out of chocolate. It's had a TV series, it smelt amazing in there. 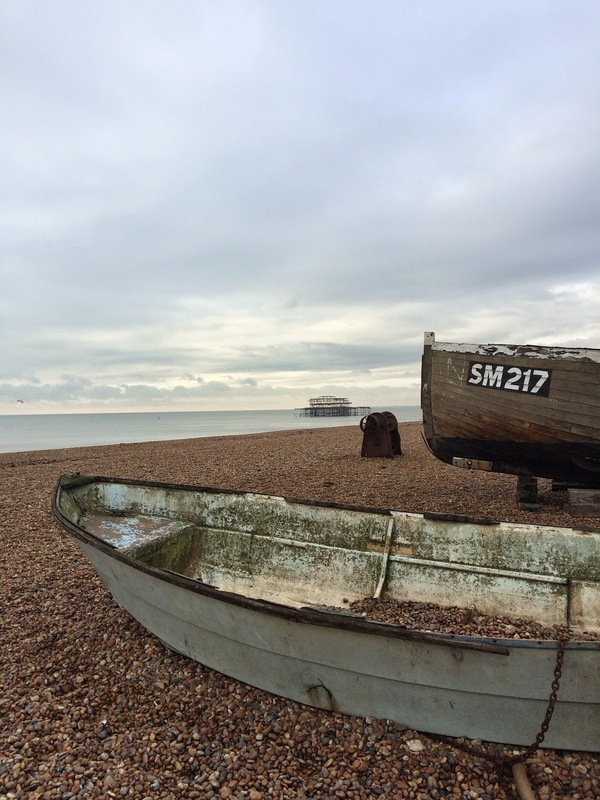 Both the Lanes and North Laines are worth a wander if you're in Brighton for the day, there's so much to see and do whilst being compact at the same time. From the Lanes you're not far from the beach, walking past the more main stream high street shops and restaurant chains. 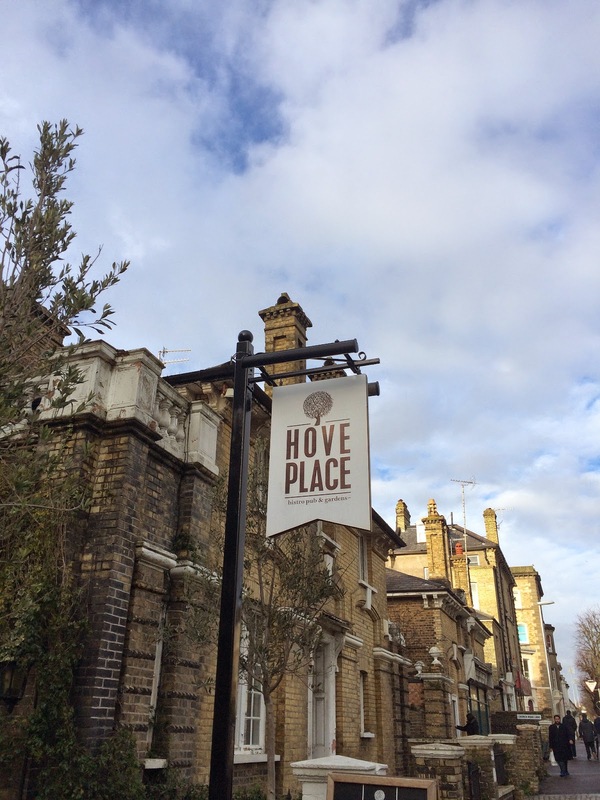 After a look around the shops, we started heading towards Hove where I'd booked a pub for lunch. 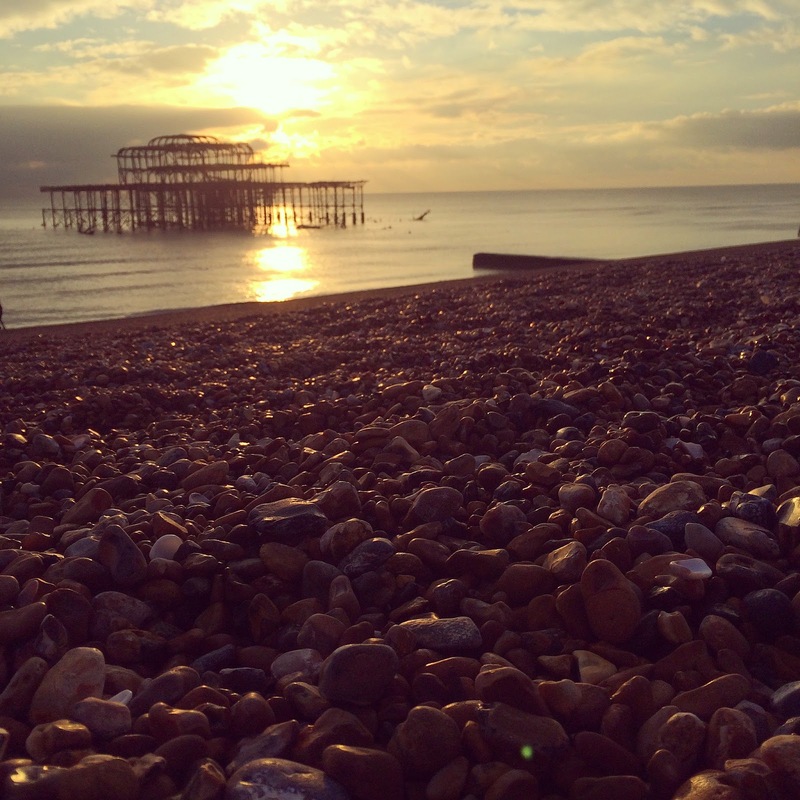 In the past we've always stuck to Brighton for food, there's everything you could ever wish for in terms of options. 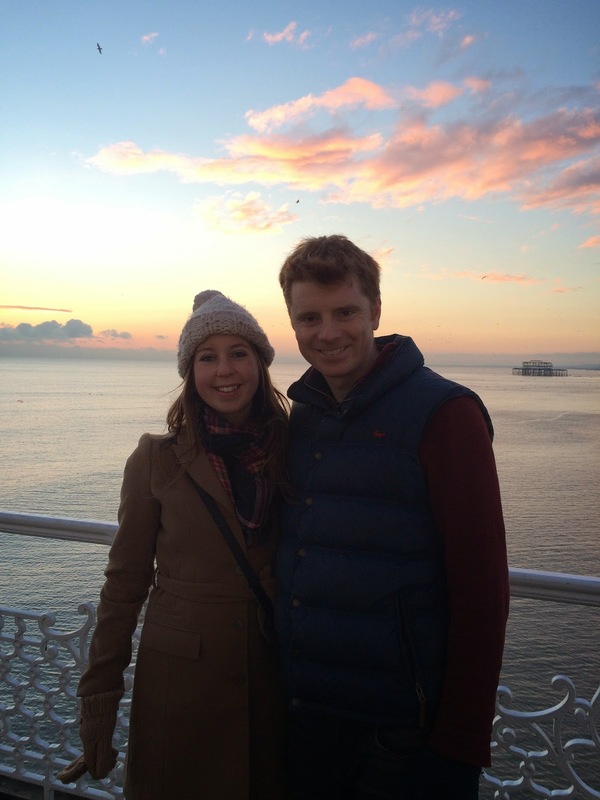 But it was a Sunday and we wanted a roast, plus we'd never been to Hove before. We walked for about half an hour along the seafront, I love walking along the beach. 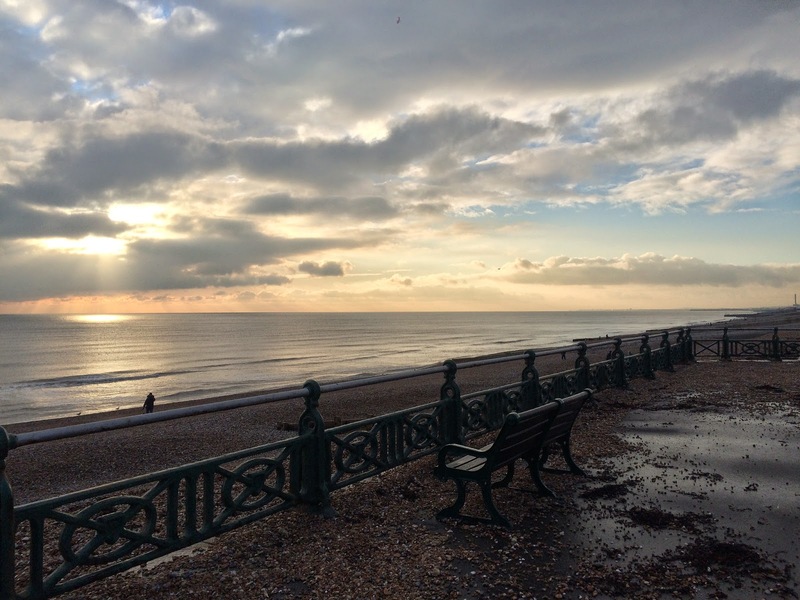 Hove is really lovely and just a mile along from Brighton. 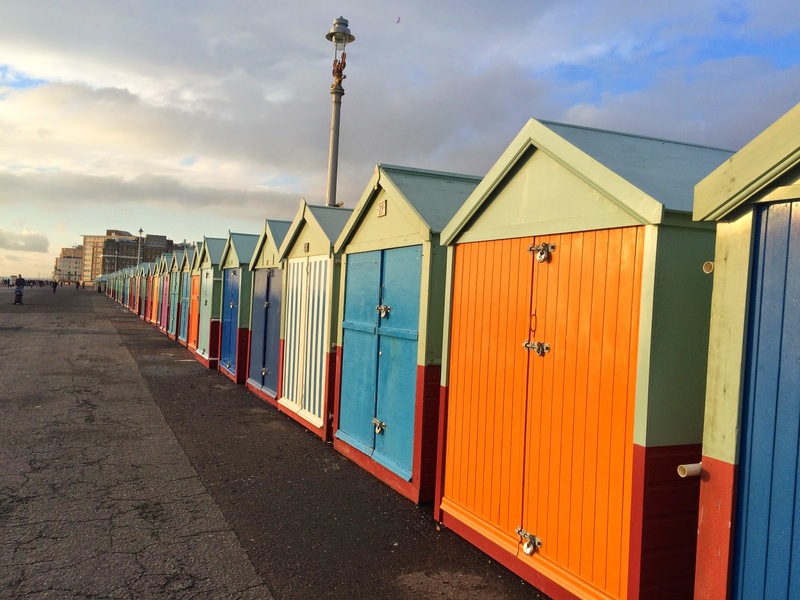 There are these coloured beach huts, big grass squares and gorgeous big properties. My Brother and I have always got on really well so I miss him when he's back at uni. We all had such a fun day together, counting down until he's back home already! But secretly jealous of his fun first year, he always has some funny stories from living in halls. 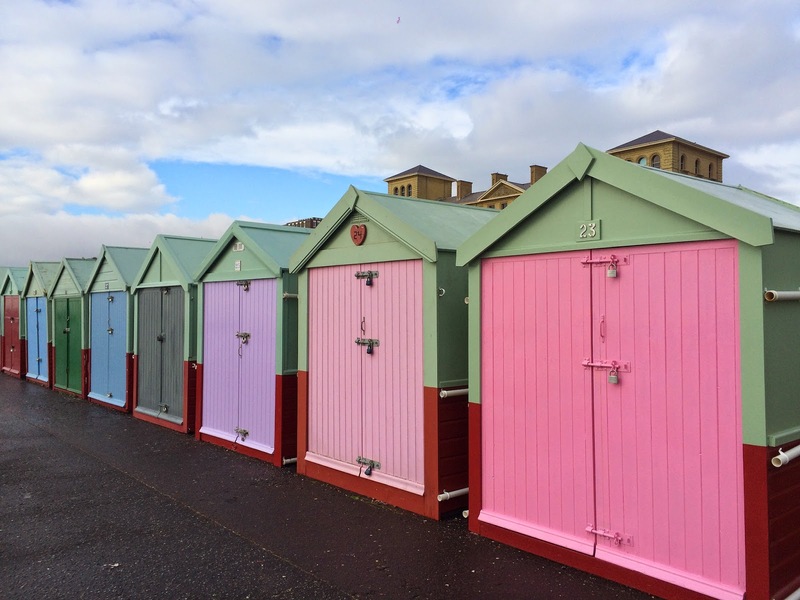 I love beach huts, granted these aren't a patch on Wells Next The Sea and they're technically not on the beach but the contrasting bright colours all in a line are pretty. 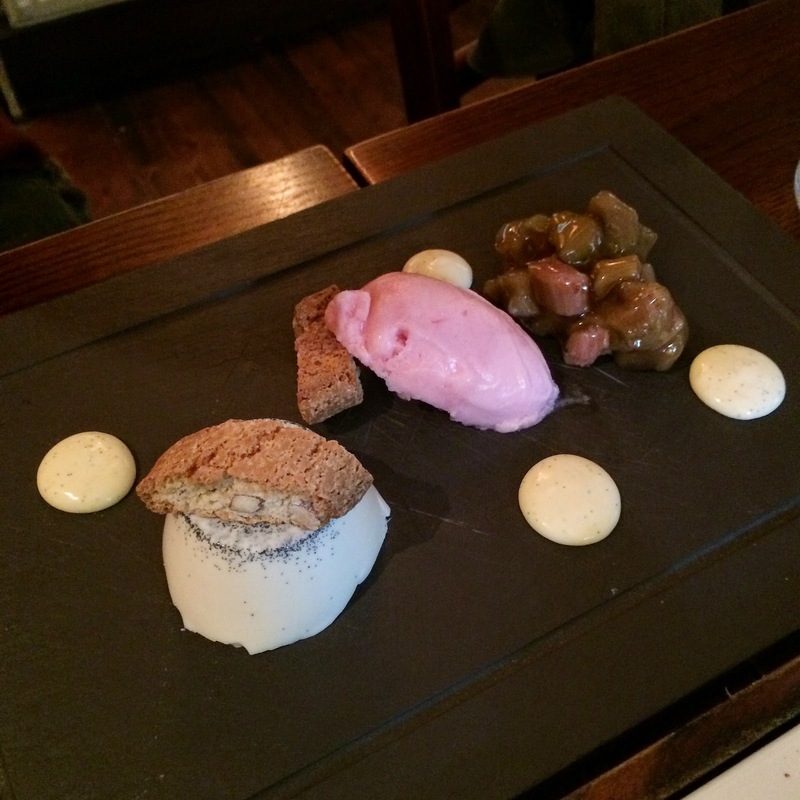 We had an amazing lunch at Hove Place, a pub I'd read about in The Times and it's just won an award for a good roast. 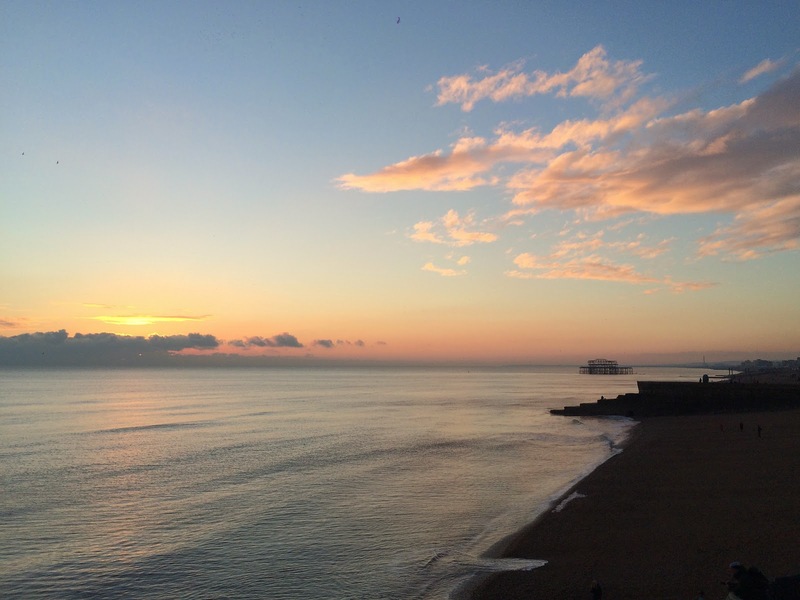 It didn't disappoint and was well worth the nice walk from Brighton. 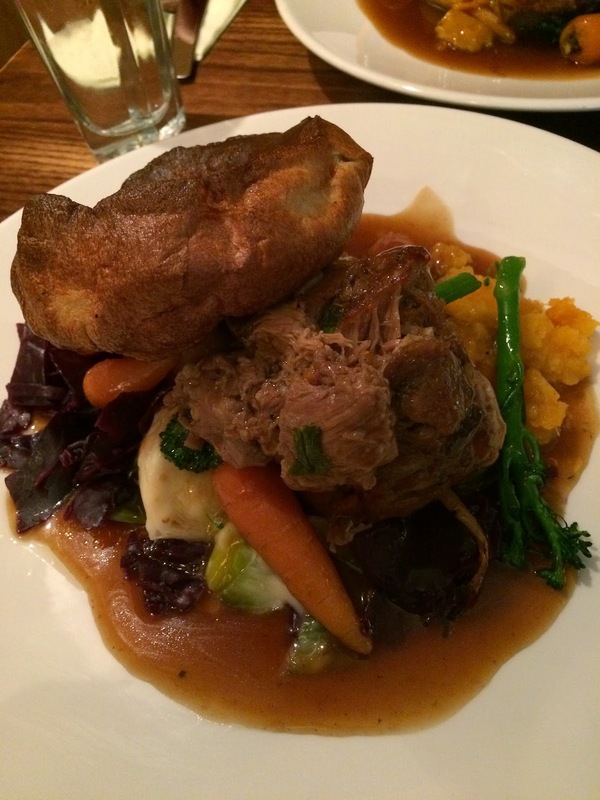 All three of us had delicious roasts, two slow roast shoulder of lamb and one beef. Big yorkshires are always a good indicator of a good roast dinner too. Book in advance, it's super popular on a Sunday. It's also dog friendly which I didn't realise before, we'll definitely take Riley with us next time. 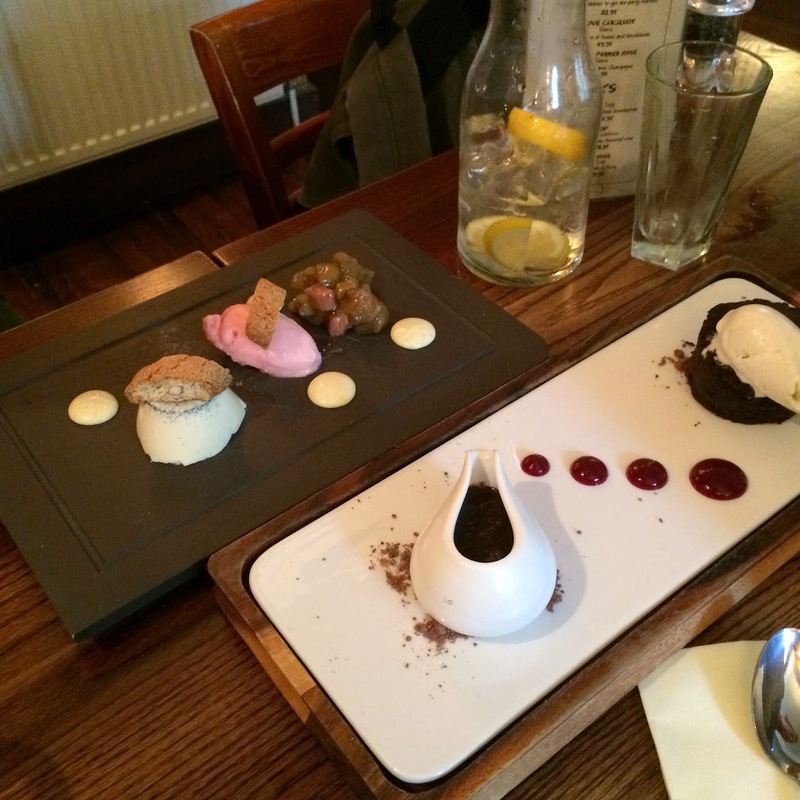 The puddings were also pretty scrummy, a rhubarb and white chocolate pannacotta dessert and a chocolate, caramel brownie with beetroot, vanilla ice cream and hot chocolate sauce. The prices were fairly good too. The sun started to come out as we left the pub with the rays shining through the clouds above the sea. We walked back along the beach with about an hour until sunset time. The sky got prettier and prettier as we got closer to the pier, this original old pier burnt down a few years ago but it's become a piece of art left in the sea. 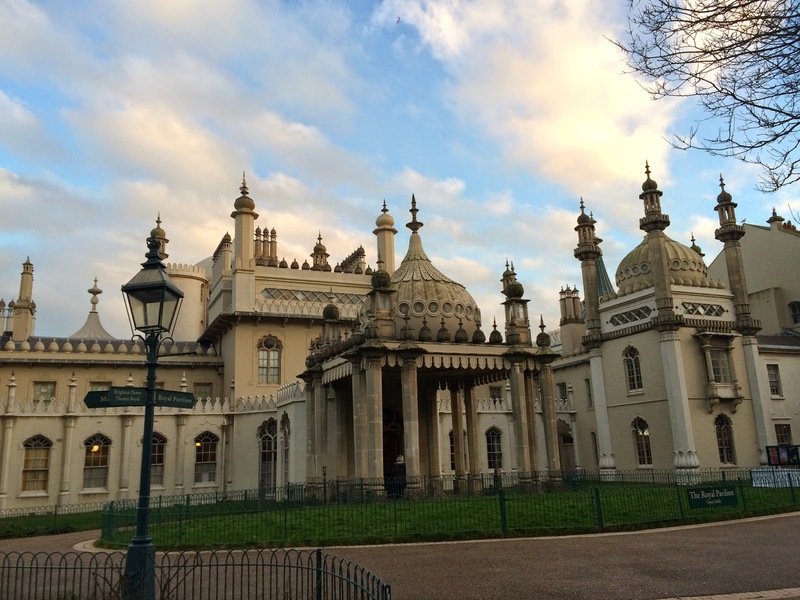 We looked around a few more shops that we hadn't had time for earlier and walked past the Royal Pavilion, a palace built for a prince once upon a time. It looks almost Moroccan or Indian, such an amazing building. There was an ice skating rink still open at the front of the palace, we just wandered through the gardens. It was then nearly time for the sun to set and we could see the sky changing so headed to the Pier. It was magical, the lights on the pier were illuminated as the sky turned pink as the sun went down. 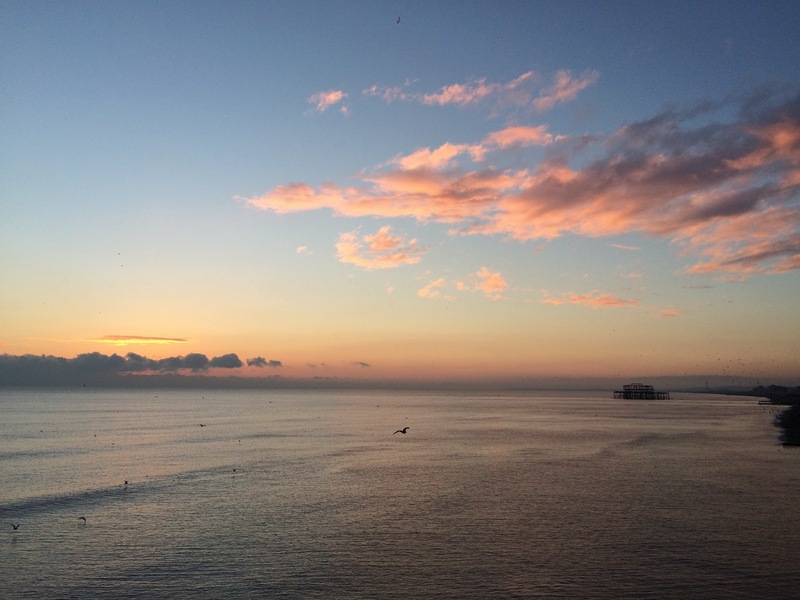 Pretty pink candy floss skies, the sea was so calm too with, seriously magical. 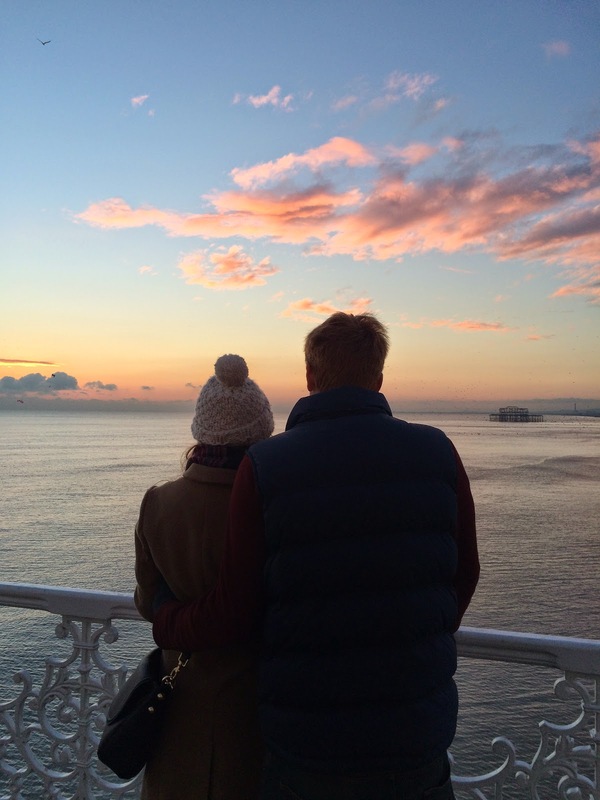 You forget how amazing sunsets and beaches can be in England, especially in January! My brother took this cute photo of Ben and I watching the sun go down and the sky changing in front of us. Amazing end to an amazing weekend spent with some of my favourite people. I'm already looking forward to the next time we're in Brighton and long summer days where you can sit on the beach in a deck chair with an ice cream. Got to love the good old British Seaside! 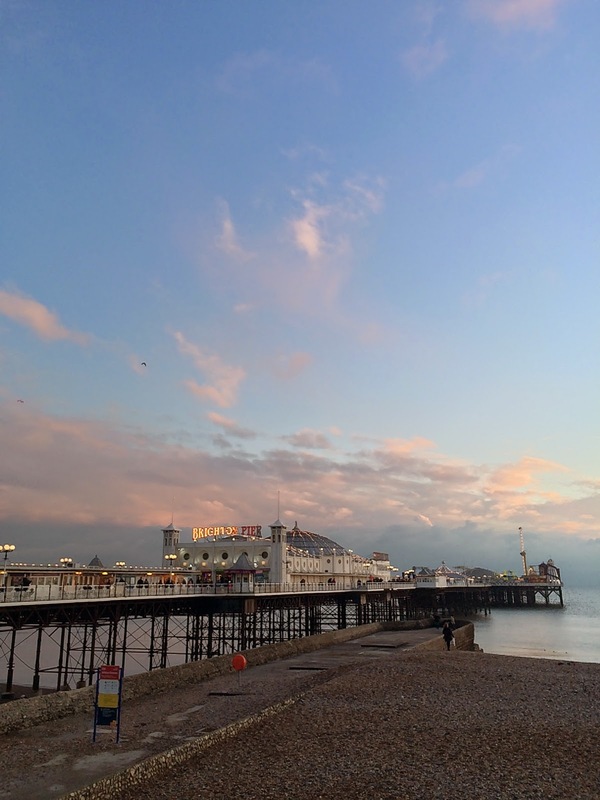 Have you been to Brighton? Would you go? Perfect day trip from London. Never been to Brighton. Must add it to my list. 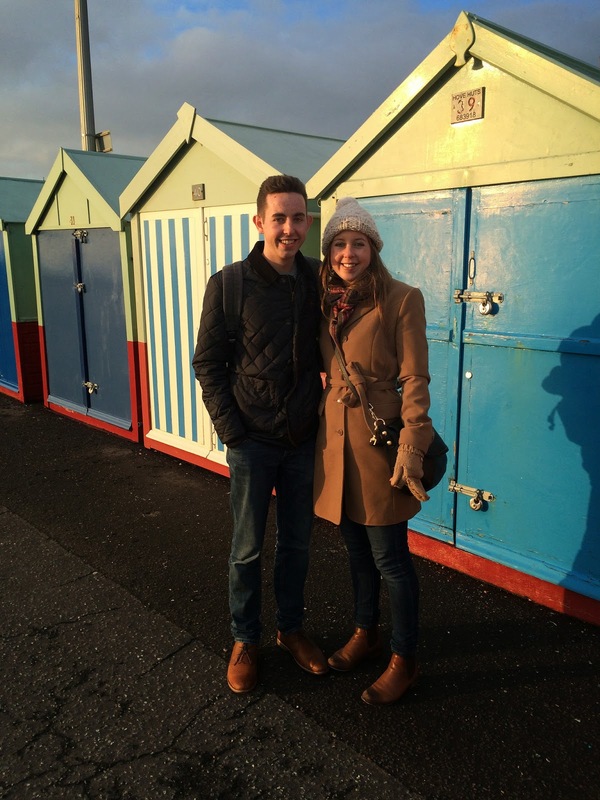 Love those beach huts! Are they expensive to buy? Or can you rent them? I love the old burnt our pier sitting in the water. It really does look like art! !